Cycling problems? 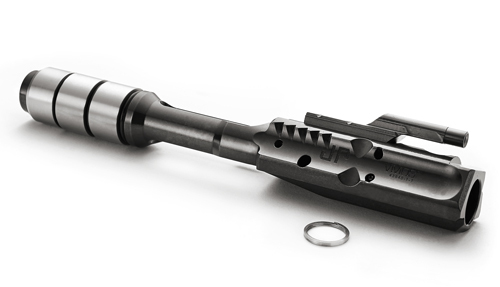 The VMOS brings the discipline your rifle needs. One size never fits all when it comes to gas-operated rifles. The Variable Mass Operating System (VMOS) carrier ensures reliability through additional reciprocating mass but provides more custom tunability. Combined with our Silent Captured Spring, multiple masses are exchangeable to perfectly tune your operating system weight. This standard version of the large-frame VMOS carrier includes three steel weights, two of which can be exchanged for heavier tungsten weights. Package includes carrier, JP Enhanced Gas Ring and instruction sheet. The large-frame VMOS carrier uses the same steel and tungsten weights as GEN 2 Silent Captured Spring units. Only the forward two masses are reconfigurable. The rear-most steel mass cannot be exchanged. This carrier will not cycle with a standard buffer retainer plunger installed. Standard buffer/spring components must be installed "loose" or replaced with a Silent Captured Spring.